We got to speak to Nicholas Rose about his work. He uses drawing and painting techniques on non-traditional surfaces as well as drawing with traditional media on paper in large sectioned drawings. 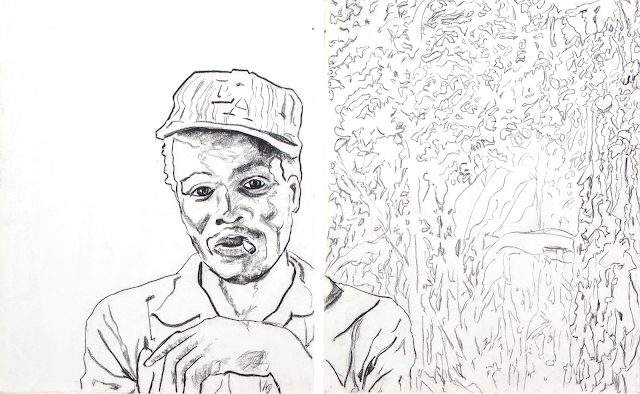 Nicholas works in Trelawny, Jamaica which is outside of the cultural capital and buzz of the Jamaican art scene. The people and places of his environment however find their way into his large-scale drawings and paintings. Nicholas has had exhibitions in Miami and has upcoming work to be shown in Venice. We want to thank Edna Manley College of the Visual and Performing Arts for allowing us to record footage at The Cage Gallery. Thanks to our camera person Danielle Russell. We invite you to visit our YouTube channel and subscribe to keep notified about new content.